The Washington football franchise is trying to build a fan base the same way Donald Trump is constructing his electoral campaign: by appealing to white anxiety. Tragically, while the team is currently mired yet again in one humiliation after another, after another, after another, Dan Snyder clings even more tightly to the name, molding a new constituency of newfound “fans” who want the team to be a symbol of the fight against “political correctness.” The team is becoming the sports equivalent of the Donald Trump presidential run, a dead-ender operation with nothing to offer but a howl of anger at a slowly evolving world. To change the team name would mean conceding not only that this beloved brand is racist but that racism and white supremacy actually exist and deserve to be fought. Similarly, to concede that the business practices of parasites like Donald Trump are a far greater cause of economic insecurity than an undocumented immigrant family is to break with a racism that for many has become a last refuge of comfort in a frightening world of debt and despair. Trump is also the embodiment of what, before the awful summer of 2015, Washington team President Bruce Allen called, without irony, “winning the off-season.” Trump is winning now when it doesn’t matter, but is on a toboggan ride toward eventual oblivion. You don’t win national elections in 2016 on the single-issue platform that white people are getting a raw deal. Similarly, the sliver of people who cheer for Dan Snyder in Southern bars to “Keep the Name” while he pumps his fist, does not make up for how many fans have left the building and how degraded the franchise has become. The Twitter feed promoted by the team that’s devoted to defending the name, @Redkinsfacts is sending out articles from National Review (since deleted) conflating the push to change the team name with attacks against symbols of the old Confederacy. They have hired a right-wing rogue’s gallery like Bush flack Ari Fleischer; Bruce Allen’s brother, George “Macaca” Allen; and Republican lisckspittle Frank Luntz to help them polarize the fanbase and keep the brand intact. This team, which has long survived by being supported by a majority-black city and play their games in majority-black Prince George’s County, seem content to play Trump and be divisive, ugly, and cruel to the fans that have loved them the most. These fans have said overwhelmingly in polls that they understand why Native Americans would be offended by the name and that Snyder should meet with the tribal councils and hear their concerns. Instead, he sneers at the very idea. I wish I could say I was surprised, but an experience in August told me otherwise. Every year my family goes to Ocean City, Maryland, a largely white, working-class, right-wing corner of the state. But in summer, the beautiful beaches and easy access mean that one would be hard-pressed to find a more integrated setting in this hyper-segregated country. That made it all the more ugly this year to see the explosion of Confederate flag merchandise. It should not have been overly surprising. In the wake of the South Carolinian removal of the Confederate flag—in response, let’s please remember, to a mass murder inside a historic black church—the Confederate flag has traveled up north as a symbol of white grievance against “political correctness,” oblivious (or perhaps not oblivious) to the fact that for many it is a symbol of the racist violence. One person’s howl against multiculturalism is another’s announcement that a lynching may be imminent, yet neither seems to care how that line has blurred. In Ocean City, I saw several shirts which were as predictable as they were depressing. It was the symbol of the Washington football team emblazoned upon a Confederate flag, with the phrase that unites them both, “Heritage Not Hate.” This new 21st-century connection does not happen without Dan Snyder’s obstinance, but it is also a shoe that surely fits. The team was named by its original owner George Preston Marshall, a segregationist who fetishized the Confederate South and made sure his team was the last in the NFL to integrate. Snyder has taken this franchise full-circle from its earliest days, when it was less a team than a political statement against a changing world, as the black freedom struggle was rolling through the south. Now this billion-dollar brand stands disgracefully alongside Donald Trump, Sarah Palin, and everyone attempting to turn a carnival barker’s buck on white anxiety. The people who pay the price for this are above all else Native American children subjected to this kind of racist mascotry. But the DC community also bleeds out a bit of itself for abiding this. A price is also paid by the players trying to live out their NFL dreams playing for a team that devotes an inordinate amount of time, energy, and resources to defending its racist brand. An organization with priorities like this doesn’t develop players. It consumes and regurgitates them. 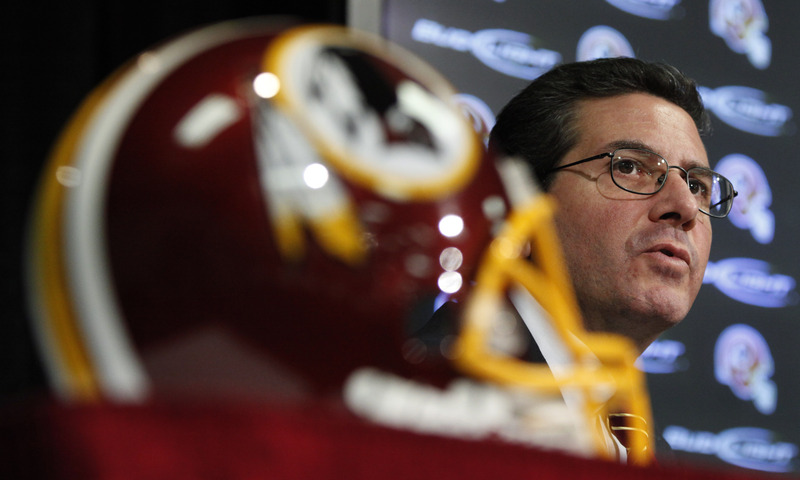 Robert Griffin III is a casualty of the priorities and the values of this franchise. He won’t be the last.